I recommend to first read East Field Alchemy, before reading this Thought. In 1994 I walked through the very first crop circle of my life, located in Boven-Smilde, the Netherlands. Since then, crop circles have, and continue to, fascinate me. Every year they bring me something new, and it is not only the new circles. When I look at previous crop circles through new eyes, I discover things that have always been there, but went unnoticed by me before. Let me share one of these magical and mystical discoveries with you. Join me and enter the truly fascinating world of crop circles. It is mid August 1994. I had just returned from a climbing holiday in the Italian Dolomites, when I see in a newspaper that was delivered while I was on holidays a photo of a large crop circle that was found just south of the town of Assen. The photo and the accompanying article touched me. I had to see that crop circle myself even though it was late in the season and I had no guarantee that field was still uncut. There was no mention of an exact location in the newspaper, but I was sure I would just drive straight to it. While searching (just south of Assen), I began to understand just how big Holland is, and how flat. I scanned dozens of fields, most of them already cut leaving nothing but stubbles behind. After hours of scanning that moment comes, that ultimate moment, that you give up. After searching for hours and hours, it had been enough. On my way back home, just outside Boven-Smilde, it happened. Straight ahead of me, just before the street bends to the left, I see further down in the stubble field an unmistakable shadow. I stop, get out, and walk into the field. A simple circle with four little circles around it. I immediately noticed that this was not the circle I had been spending hours looking for. This was not the big circle mentioned in the newspaper. No, the circle in front of me was relatively small and accompanied by four additional circles. I walked around being fascinated by everything, smelling it, touching it, looking at it, and in particular, wondering about it. After having absorbed the circle for a long time, I decided it was time to return home. Back at my car I looked once more towards the location where the formation was laying in the stubble field. Nothing was to be seen. This confused me tremendously. No matter how much effort I put into looking, I could not see the formation. I got into my car and drove the same stretch of road from which I had discovered the formation, over and over again. It was impossible to see any part of the crop circle, although when I drove that street the first time the crop circle was perfectly visible and easy to spot and easy to see. I was in shock. Right there and then I was sure, I had to travel to England to discover for myself what on Earth is going on. That all happened in 1994 and now it is 2008. This 2008 summer I will be in Wiltshire, England for the fourteenth time and I will for the first time bring a group with me. I am convinced that the 2008 crop circle season will also generate some great surprises like all the previous seasons have done. Like for instance 2007, when I again, for the first time in a long time, analysed the geometry of some crop circles. One of them was the formation that came down on June 3rd, 2007 in the East Field near Alton Barnes, England. A truly intriguing crop circle that by analyses turned out to be constructed around a core of nested squares and circles. While I was playing with the geometries of the shape, I discovered something that shocked me deeply. For a long time I stared at the drawings on the paper in front of me, but no matter how I tossed and turned the shape, I had not been mistaken. Hidden in the geometry of the crop circle was undeniably ‘squaring the circle’. Squaring the circle is about two shapes, a square and a circle, whereby the perimeter of the square is equal to the circumference of the circle. Squaring the circle. Squares and circles. I remember seeing many crop circles in 2006 that were build on a core of squares and circles. 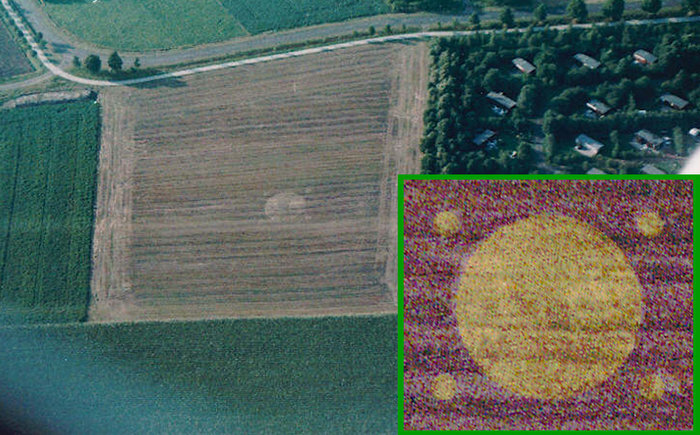 And even 2005 showed crop circles that were saturated with squares and circles. But these crop circles were not really ‘squaring the circle’ as the formation of 2007 in the East Field did. Squaring the circle has a unique feature. Although it just contains one square and one circle, it is impossible to construct the one out of the other. With the technique of ‘constructing’ nothing is measured. The only tools used are a compasses and a straight edge and the latter only for drawing straight lines. At this time and age we are able to prove mathematically that it is impossible to construct ‘squaring the circle’ just be using these tools. Starting with a square with a given perimeter, you cannot construct a circle with a circumference equal to the square’s perimeter. And vice versa. This impossibility can be proven nowadays, but for centuries generations of great minds have tried to find a solution. To no avail as we know now. Although there are methods that come close, still none of them are 100% precise. The method that I discovered in the crop circle of June 3rd, 2007 is of a stunning simplicity and its accuracy is frightening. It is 99.96% precise. The diagram above on the left shows one of the steps of the reconstruction of the crop circle. The small circle is copied with its centre on the perimeter of the original small circle. See diagram above on the right. The diagram below on the left shows where ‘squaring the circle’ has hidden itself. The small circle fixes the position of the square, and with that, its size. The green square has a perimeter equal to the circumference of the outer circle. The diagram below on the right shows the crop circle with ‘squaring the circle’ projected onto it. The red arrow indicates the square going through the exact centre of the little black ball. I never came across this method in a book. Where does the method come from? What is the method trying to tell us? Questions, questions, questions. My thoughts began wandering to the work of Alan Brown. He showed a couple of years ago how many of the quintuplet formations (crop circles with a central circle and four circles around the centre like the number five on a dice) of the late eighties and early nineties were containing relatively precise methods for squaring the circle. All the methods had the use of pentagrams and five-pointed stars in common. His work has already, many times, drawn me back to my very first crop circle of 1994. Also a quintuplet, but because of its irregular symmetry I have never been able to discover ‘squaring the circle’ in it applying Alan Browns approach. Still, again I was drawn back to my first crop circle in Holland in 1994. Likely because the 2007 East Field crop circle was based on nested squares and circles and not pentagrams, but while I was looking again at the old 1994 formation I fell into complete silence because of what I saw. I was speechless. How could I have missed it all these years? It was so simple. In front of my eyes, screaming at me from the paper, I was confronted with a 100% accurate squaring the circle. The first crop circle that I ever walked through and that was the cause of my quest of the last 15 years for the answer to the question: “What on Earth is going on?”, contained a magical wonder of a ridiculous simplicity. The diagram on the left is a graphical representation of the crop circle that I discovered at Boven-Smilde, the Netherlands, in 1994. The diagram in the middle shows how simple ‘squaring the circle’ has hidden itself in the formation. Do notice how the square and the small circles are slightly overlapping. The red circle though exactly touches the small circles. It is the square around the central circle and the red circle that touches the small circles, that together form 'squaring the circle'. The diagram on the right shows another element of amazing beauty. If the small circles would have been bigger or smaller, ‘squaring the circle’ could still hide itself in the formation as long as the small circles were placed at the right spot. But… the small circles are exactly of the right size to be captured by a set of lines that define the square at the top side and bottom side and at the same time define the circle at the left side and right side. ‘Squaring the Circle’ created and captured at the same moment. Truly fascinating. 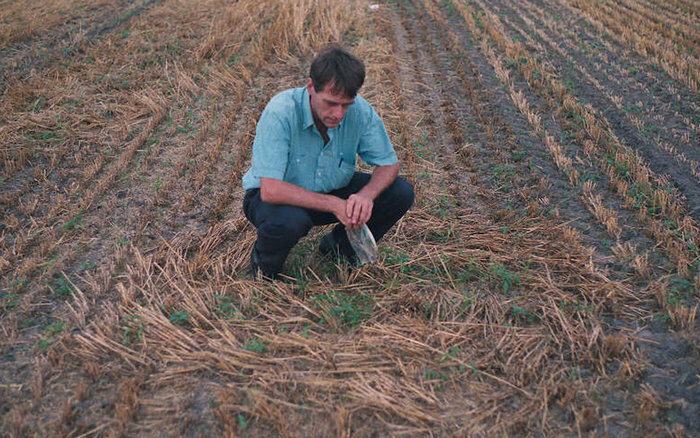 The crop circle that I discovered in 1994, which in hindsight I actually never could have seen, contained a solution that always has been there, but which I didn’t see until now, 2008. A perfect reflection of my own discovery journey, of crop circles, and of life itself. The magic of ‘squaring the circle’ lies in the fact that it, as far as I know, does not show up in nature. It is not a natural geometry like the phi-ratio is or the Fibonacci sequence. It appears that ‘squaring the circle’ is originating from elsewhere. From the other side. The only place where you can find natural ‘squaring the circle’ on Earth, is in crop circles. One of the reasons why crop circles have such a profound effect on us. Squaring the circle brings the square (= cube = matter) in perfect balance and harmony with the circle (=sphere=Spirit). The ultimate merging of matter and Spirit. The ultimate Oneness.